How Long Is The Mailbox Line? 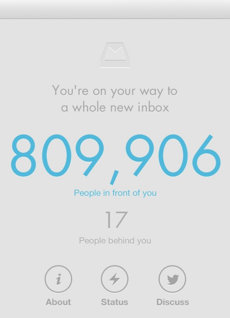 The line to try Mailbox, the new iPhone app for managing your inbox, is long. Really, really long. I signed up the day it went live in the App Store, on February 7, and finally made it to the front of the line this morning after two weeks of patient line-waiting. While I was waiting, I’d occasionally open the app to see my place in the queue, and think — what if the line was real? Imagine an ever-growing line of weary people fiddling with their phones, sprawling off into the distance. How long would the line be? If you signed up right now, you’d find yourself at the end of a line with 807,896 people ahead of you. They’re letting people in at a near-constant rate of 800 per hour, or just over 13 people per minute. Let’s assume that people standing in line take up an average of two feet of space, from back to back with room for personal space. The line stretches over 300 miles into the distance. To put it in perspective, that’s further than London to the outskirts of Paris. It’s 30 miles longer than Hollywood to Las Vegas. It spans from the Bronx to Portland, Maine. But it’s moving! Slowly. At about 0.3 miles per hour. You’re shuffling along at just over five inches per second. At the current rate, you’ll make it to the front of the line in about 42 days. I hope you brought a charger. To put this into whatever the infographical version of perspective is, that’s like if all 20,366 worldwide Starbucks locations had 39 people in line. Next: a Venn diagram showing the overlap of people in the @mailbox waiting list and people currently standing in line at a Starbucks. It would fill 18 of the 30 major league baseball stadiums to capacity. Waited for a week to delete it in a day. very meh. It’s essentially the population of San Francisco. I bet that’d be a good Venn diagram of overlap. Guys make sure you don’t leave the line. If you don’t try Mailbox you’ll catch jaundice and so will you future generations! By the time you’ll get to the front, Email won’t be relevant anymore. Hold the phone. It’s an app that lets you check and organize your email? Woah. I like how in the northeast 300 miles crosses so many states. I live in Oklahoma. 300 miles east of me is… more Oklahoma.